I tried several times to get train ticket it keep crashing! Its annoying. Navigating the South of France and Italy with ease!!! I would’ve been lost without a few apps at my disposal during this trip...Omio is one of them! It made getting around for someone who speaks NONE of the languages common to this region, so easy!!! Destinations are clearly mapped and times/fares are accurate and very helpful when planning what you can squeeze of this lovely area into the time you have. I’ll never travel to Europe without it. At first I was nervous but it is self explanatory. This app is easy to use and is full of pertinent information. Various routes are offered via multiple train/tram companies, as well as air and bus options. It includes filters, number of stops, route numbers, timing of stops and length of trips & layovers. I don’t believe you can purchase tickets on this site, but it’s always the first place I go when considering my options for European travel. My first compliment is that this site is very easy to use and provides up to date comparisons between different modes of travel. A real life example happened to me while I was traveling in Germany. I missed boarding a train because the ticket booth had not yet opened and ticket machine was complicated to use and wouldn’t accept my credit card. So I unpacked my laptop to access this site to buy my ticket for the next train. The ticket was instantly sent to my iPhone. This incident taught me to check this site the night before travel. Simple, easy layout and quick result but I wish it has an options by user as a filter such as “ sort by cheapest or fastest” just like when you search for deals stuffs. 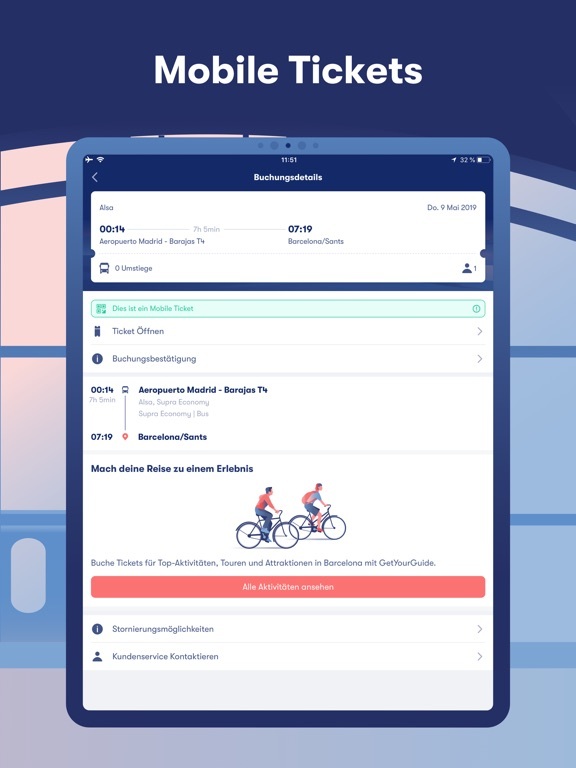 I am a new traveler trying to navigate Europe and this app has made it insanely easy to find travel from city to city. I’m so excited to explore all these beautiful places thanks to this easy app! I bought a ticket thru the app that stated it was a mobile ticket. Then I recurved an email saying I had to print the ticket to get on the bus. When I emailed customer service with the proof that I purchased a mobile ticket they replied 9 days later saying couldn’t assist me because the email said I had to have a printed copy. I wasn’t allowed on the bus and missed my trip. overall disappointed my entire experience. As I checked on some train tickets the price continued to go up 3 times, this seems like a con job! Would give 0 star if I could. Purchased a ticket through them. Never actually received it. They used an employee email instead of mine. Hours of calls later in Dutch. Thank goodness my hotel in Amsterdam helped me. What a rip off. Great app but persian language need to be added. We’ve never been to Europe and are so glad we found this app. It makes it so easy to see exactly how much each mode of transport costs, and when/where we can go. Love it! Perfect for the best Eurotrip ever!!! I’m just crazy about this app because it shows you not only buses and flights, but also trains!!! And you can book from it too! I’ve been planing the perfect trip all over Europe and this is making everything easier and better! Highly recommend if you wanna see more without spending more. I’m in Europe for 5 months and this app has let me get around very cost effectively. 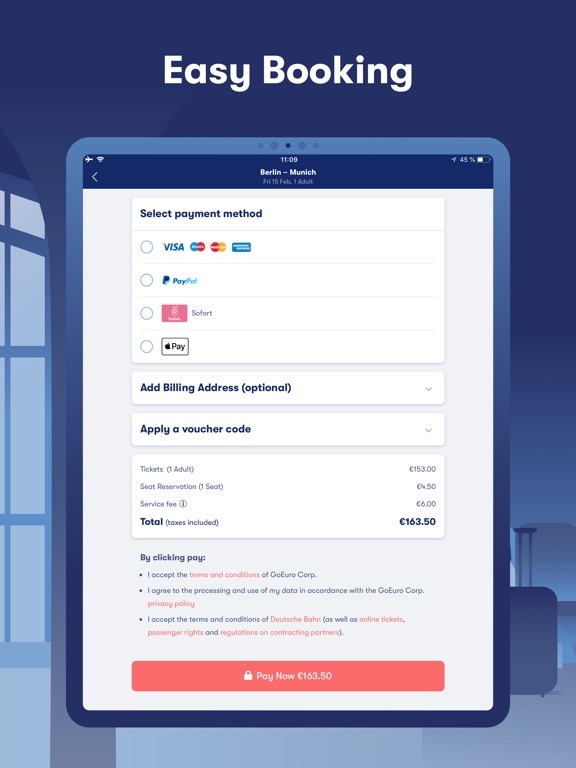 Who The price is much more than buying from the eurostar Online. This app was a straight up nightmare!!!!!! It charged me twice for the same ticket, the first ticket price was 49$ and I was charged but instead of confirmation I was told someone “swooped in and booked my ticket” and the price increased to 114$, it still would not process my purchase I had to use someone else’s phone to successfully book my ticket for the higher price, naturally, so I advise AGAINST this app under ANY CIRCUMSTANCES!!!!!!!! I have used this app to help me plan my last couple of trips to Euro. 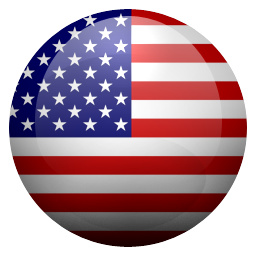 As an America it has greatly helped in our travels and figuring out how to get around. Good app and easy way to find tickets. 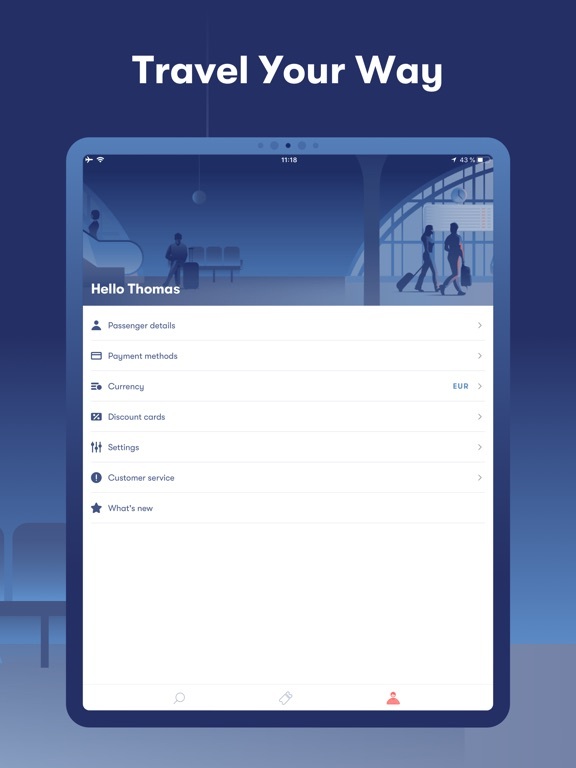 I have traveled around Europe trying to find a bus, train, and plane with this app, and I have never had any information come up about anything. I would never recommend this app! It’s a major waist of time!!! We really appreciate the layout of the site, seeing the travel options, since we travel “free style”, booking two to three days ahead and often with no definite itinerary. Your app is not working! How can it be fixed?? Tried to use it for several times and it says - Oops, something went wrong.. Thanks to the team of GoEuro It’s a fantastic app. Incredibly convenient for any travel through Europe. 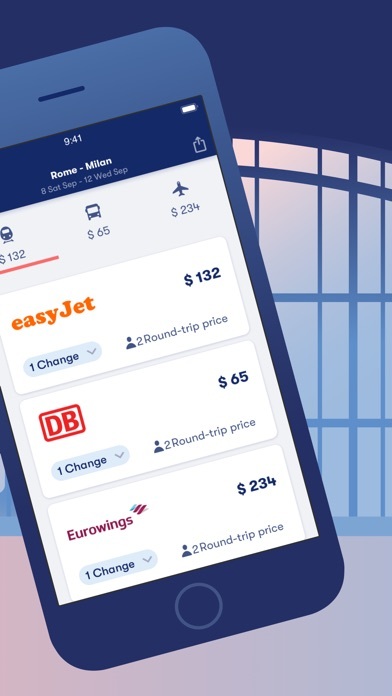 Flights, buses and air travel all on one app IN ENGLISH! Wish we had something like this in US! If your traveling or planing a eurotrip this app will help you to save time and organize the days of your stay . super easy to use & shows all the options! I’ve used the GoEuro app for train travel in Italy and Switzerland and find it very user friendly. I have also been able to frequently find cheaper fares than with the company sites. The only negative is that if you want to know the platform info, you need to get that info from the rail company sites. I use trains a lot for work in Europe and it’s always a pain to find connections & decent prices if you cross a border. This app delivers! Tried to book a train ride from Milan to Portofino on TrenItalia but it was sold out. Couldn’t believe the super cheap fare I found on GoEuro! And it also had the time I needed to travel. The same time was sold out on the TrenItalia site! I downloaded the app and pulled up my reservation. It was easy peasy. I just hope it works tomorrow at the station! This app saved our vacation! We had booked a Mediterranean cruise that left out of Rome, however our connecting flight was 8 hours delayed because of mechanical problems. Which meant that we would just miss the boat. We asked the ticketing agent to rebook us on a flight part way thru the cruise so we could have some semblance of a vacation. The gate agent told us that no flights were available. With this app, I was able to book a flight to city that the boat made its first port while flying on my delayed flight. The tickets were actually really cheap for booking them literally 12 hours before the flight took off. This app saved our family vacation!! We didn’t miss any our our cruise! Thanks so much!!! I need to make little trips frequently and this helps me plan and choose the best option quickly and easily. I use this app every time I travel! I can plan my trips so easily and quickly on my iPhone! I've used it for rail tickets and I can't complain! I planned all my European adventures on this app when I was studying abroad and saved loads of money when I saw comparisons. I recommend to every friend who’s studying abroad in Europe now. Handy app to have as you travel Europe, however does not show local trains, buses or trams. Also, you can not put in an address of a place, and search, it has to be a train/bus stop, or name of city or airport. Amazing, but sometimes don’t show the best prices, but you can always check in other places, but overall it id one of the best apps for traveling EVER!! Perfect app. Limited on train connections & combinations though. This app is great for Americans who are unfamiliar with trains & buses in Italy. Slightly a bit more euros, but oh so worth it. Get your ticket, screen shot the ticket if you don’t have data & show on the train. Highly recommended! If you’re not using this app, you’re missing out, or, you have really bad friends for not telling you about it. It was my first excursion into Europe. If I could do it over, I would not have purchased a Eurail pass and planned everything through flights and used local rail for short connections. What I spent on the rail pass, I could have flown much easier with much less headache, and had time to see twice as many places. I downloaded this app just to leave a one star review and this comment. I was forced off of my article to this app in the AppStore. I could not read my article without declining several dozen times to leave the page, then being taken here anyways. Used this my entire month hoping around Europe. Easy to use. Combines multiple companies and ways to get around. Best prices. 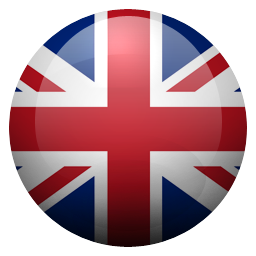 Best app ever to rock Europe! Let’s you see the schedules and prices but will not process any US bank issued credit cards. Waste of time and effort. If you’re traveling Europe on a budget, this app is a must!! The ticket prices for buses, trains and flights within Europe are unbeatable. I’ve saved hundreds of Euros thanks to GoEuro’s discounted train and bus tickets. I just got the app, so it's all still new to me. But so far so good. Very convenient and easy to use. Thanks! This app really helped me plan our European itinerary and to figure our costs for the trip. It gave me options between bus, train, and plane costs and time frames. Good job Go Euro! GoEuro is a must have app when traveling around Europe. It’s fast and easy to use. The price with buses and flight is highly useful when deciding to take the bus, train, or fly. This app really works well. It gave me several options for traveling Europe by train , bus or plane. It really helped in my planning. Nice work. 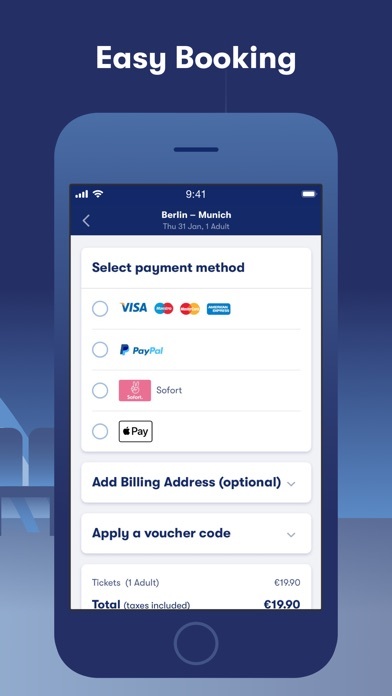 I love using this app to quickly price and buy train and bus tickets for travel in Europe. I like how I can see the fastest or the cheapest route too. You can see info sorted by types of transportation also. 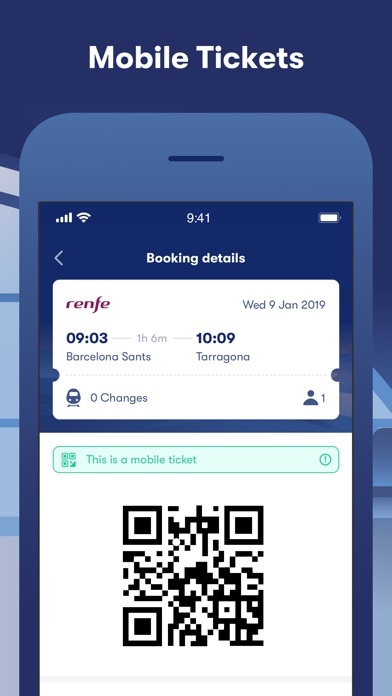 No need to print tickets-just show your QR code on board. Love it. Excellent app. Super easy to use and they really find the best prices. First time to used but it’s so easy, now were travelling and I’m so excited to use it. It’s an amazing way to look into travel around Europe. Simple to use. You have to be creative about to and from locations because it only is based off the information you give but if not from one town, change town to maybe a bigger town and there are amazing options. Anytime you try to add a ticket to your account the app shuts down and needs to be redownloaded to ever open again. Every time I put in my booking number, the app completely shuts down, and I am completely unable to open it again unless I delete and redownload it. I’ve tried making an account, not using an account, and I’ve downloaded it three times and the same thing keeps happening. I have an iPhone SE and my software is absolutely up to date. I’d just like to have my digital ticket. I used this app extensively for travel in Europe. I found it very convenient to book trains directly in Italy, France, Spain and Germany. However with the rest of the railways and all the airlines in Europe, they don’t provide any “direct” ticketing. That feature is great. I think they are on the right track but Ned to expand their “direct ticketing” feature extensively. 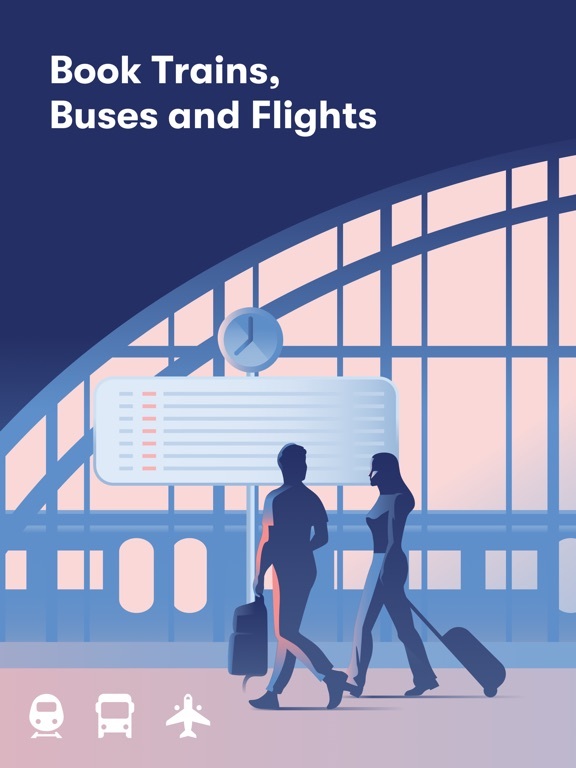 If nothing else it gives a great overview of all the available bus, train and plane schedule and prices all in one place. That was the most convenient and helpful part of the app. Payment fails every time with any card. This used to be my favorite way to book. This is he best app I've seen for travel in Europe. Especially air fare--European airlines especially ryan air may seem to fly direct to your final destination but rarely is the case. This factors in the travel time from those airports to your final location. Either using public transit or train. I can't comment on pricing and how it compares to other services but at least it's revealing the additional charges and travel time. As a traveler in Europe I've spent a decent amount of time and money on a bus to get to my final destination that wasn't expected. 2hrs to be exact. An app with much potential but zero flexibility. You constantly have to change the dates to find a cheap fare, it offers no suggestions and no weekly/monthly outlook. Additionally, the sort by rate feature is partially functional, mostly broken. Annoying theme too, too much blue everywhere. Skip it, use the net, more flexible/practical. It works perfectly . 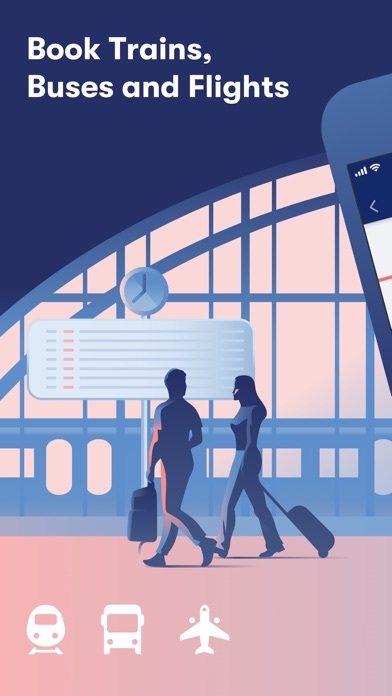 Download this instead of downloading a bunch of bus, train and flight apps. Great side by side comparisons of options for travel in Europe. English speaking friendly too! Would recommend this app to everyone! Love the app. Makes it easy to book a trip. I've just contacted my first ride and set up my profile. So far all good !! The app makes reservations so easy! The fares are the best around, the information hearty and the ease-of-use is excellent! The only way to get a train ticket to Europe! Go for it! This app is excellent!!! And SO easy to use. 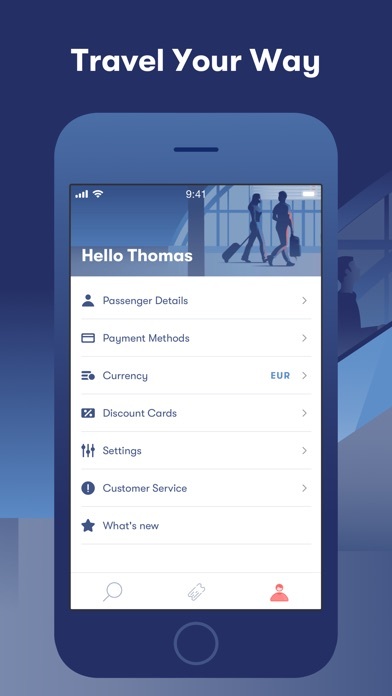 Great App for Traveling in Europe. 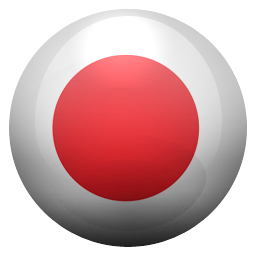 Easy to use, very fast, and I have been happy with this app. I would recommend it to others. If you are traveling to Europe this app is wonderful. Traveling between countries can be a challenge this will help. Simple and easy for use. Very usefull.